Sharon and Owen’s Story: When I picked her up, she looked into my eyes and I knew we were meant to be mother and daughter. I woke up on Thursday 11/11/2010 at 5:30 a.m. with cramps and some blood. I called the contractions cramps at the time but now I realize they were what my contractions felt like… a very mild cramp every 5 minutes lasting for 1 minute. I called my Doula and my midwife at 6:00 a.m. because I was concerned about the blood and the contractions were so close together. I should have waited until 9:00 a.m. but I panicked because I felt the baby was ready to be born. After not having any bleeding this whole pregnancy I thought maybe this could be the pushing stage starting soon and my contractions were regular. I felt so bad for waking them up so early. From 5:30-9:30 a.m the contractions kept coming at a regular pace every 5 minutes and lasting 1 minute. At 9:30 a.m. all contractions stopped after I ate some eggs and rice cakes. I was still convinced it was just a bowel movement and there was no baby coming. I think I was in denial or I just couldn’t believe I was at the pushing stage. What happened to my 1st stage labor and transition? I called my doula Kassie Anderson @ 10:00 a.m. She called my midwife, Valeriana, and my midwife called a backup midwife who lives near me in NYC. Cara Muhlhahn arrived and I was lying on the bed on my stomach just working through the contractions. My midwife, Valeriana Pasqua-Masback, came soon after Cara arrived. I stood on the floor in a squatting position. I was wearing my late grandfather’s hospital gown to feel close to him. Cara joked, saying, “we’re having a Homebirth…why are you wearing a hospital gown?” My husband joked that we wanted to “bring a little touch of hospital to the home”. I laughed and felt the presence of my beloved grandfather in the room. I started pushing in the squatting position @ 12:10 p.m. My first two pushes were ineffective because I was talking and chatting through them. Valeriana told me that I needed to focus and push my baby out. I listened to her and found the strength deep inside to push the baby out! It was the most incredible feeling to push. At one point they said that I could feel the baby’s head if I wanted to. I asked if I should wash my hands first. That was a silly question but I touched the baby and it had hair! I pushed about 8 more times and the baby came out at 1:06 p.m. When she was on the floor, Lily had looked around the room. When I picked her up, she looked into my eyes and I knew we were meant to be mother and daughter. 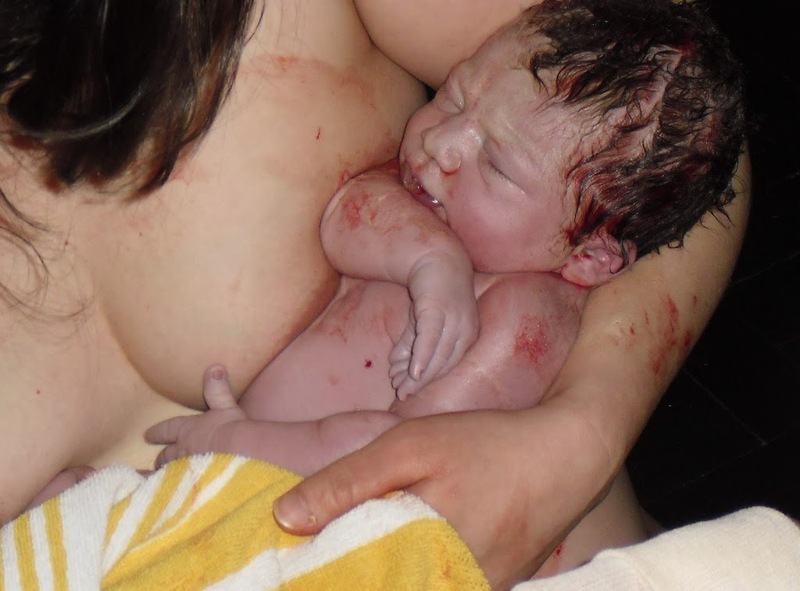 The experience of birthing our daughter, Lily, is one that I will never forget. It was the most wonderful experience of my life and “the pause” was the most sacred moment for me. I didn’t know or even realize what had happened until I was able to regain my consciousness and find my baby in my own way and in my own time. In that one moment, I cared for all babies and felt connected to my grandparents and ancestors in a profound way. It was an amazing moment and I can’t thank Valeriana enough for giving us that precious time to discover each other. That pause has stayed with me like a beautiful waking dream. Lily was on my chest for one hour after birth and she did the breast crawl. She found my breast at 2:10 p.m. and we enjoyed our first feeding together. I’m in awe of mothers everywhere! This entry was posted in Uncategorized on December 2, 2010 by Mary Esther Malloy. Thank you for posting these lovely stories, and of course, your own, Mary Esther.